Light Tables and Lightboxes are a fun and clever device used by professionals and hobbyists alike. It can make all the difference in the rendering of your artwork or design projects because it allows you to see fine lines and shapes better than with a standard light. It is an ideal tool to have for anyone who wants to be able to do finely detailed work, tracing, or who just wants to work on projects with better lighting. Most lightboxes today come with filters that reduce eye strain and fatigue, and this is another benefit of using them when creating your next project. A light table is essentially a fixed position lightbox, or in other words a table that has a lightbox insert built in. Older versions of these used filaments underneath a glass table top. Today, it is far more common to see tablet like lightboxes as opposed to old school light tables. But as these are often very large, especially for architectural and technical drawing, they are often referred to as light tables. 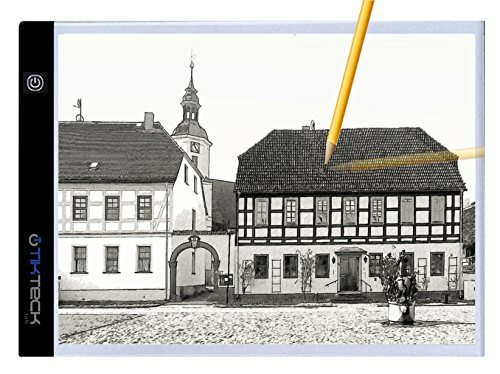 What Is A Lightbox or Light Table? A lightbox is a device that is used for creating different forms of artwork, viewing film or slides, or used by professionals to make designs. It has a flat surface covered by glass or acrylic and provides illumination from LED or fluorescent bulbs located under the surface. Lightboxes used to be made out of heavy materials like wood, and they would often stand on a table used expressly for holding the lightbox, also called a light table. These days, most lightboxes are portable and lightweight so they can be used on any flat surface. 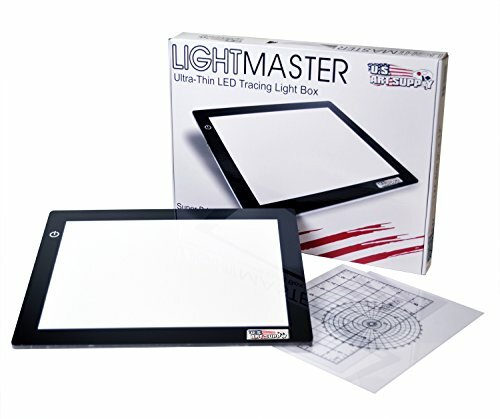 They are also called light pads, drawing light boxes, or tracing boxes. The newer lightboxes are not really even boxes. They resemble electronic tablets, and with the exception of specific industries, most users have opted for these new models and have foregone their bulky counterparts. There are many professions for which a light box can be used. Architects often use them when drafting their designs. They are vital pieces of equipment for artists who specialize in graphic design, comics, designing tattoos or illustrating. They are also used by photographers to view negatives or slides. Additionally, they are used in many medical establishments to view x-rays. Professionals aren’t the only ones who use light boxes either. Many crafters and hobbyists find them indispensable for diamond painting, scrapbooking, quilting, and calligraphy. In fact, they are highly popular for many uses among the world of creative people. Why Would Someone Use A Light box? Why Not Just Draw With A Light Next To You? A light box provides “backlit illumination” that allows the user to see more detail and refine their work with extra precision. This is particularly helpful in trades like architecture and drafting where exact measurements are needed. Further, they allow one to easily trace a design without having to strain to see the lines. Tracing is one of the primary uses, and the lightbox makes it much more comfortable than traditional lighting. If you are considering purchasing a lightbox, you will want to make sure you get the right model for your needs. Some have adjustable lighting, which is helpful. 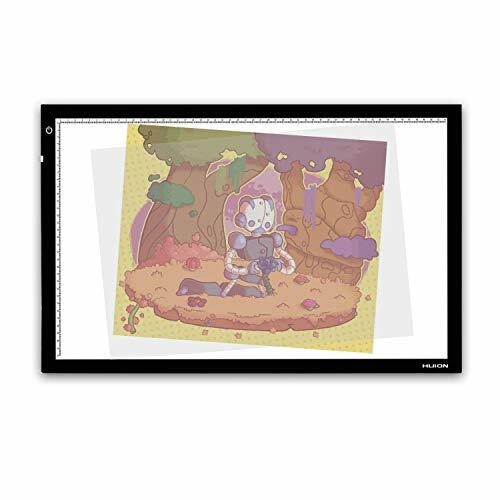 They also come in different sizes so you will want to make sure that the lightbox you purchase is large enough for the project you intend on using it for. If you are just looking at slides, a smaller version will suffice, but if you are creating a drawing on an 11 x 14 piece of paper, you will want the surface to be at least that large to work for your project. Additionally, some lightboxes use AC power cords that plug into a wall outlet. These typically emit the brightest light. Other models have a USB cable that can be plugged into a computer or battery pack. These are ideal for people on the go. Most of the light boxes in our review are lightweight and portable enough to be carried in a backpack or a laptop bag. 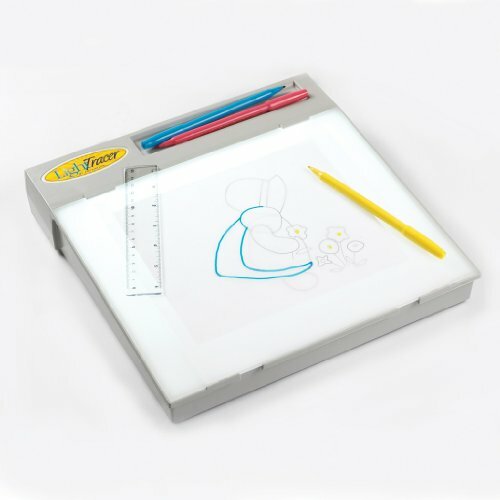 This thin and lightweight lightbox sold by Picture Perfect is ideal for tracing and drawing. With a 12×9 inch work surface and weighing just over a pound, it is highly portable for artists on the go. The unit comes with a cord that can be plugged into the wall or to any USB port, making it convenient to use anywhere. There is an advanced built-in filter that blocks some of the LED light, eliminating eye strain and fatigue. 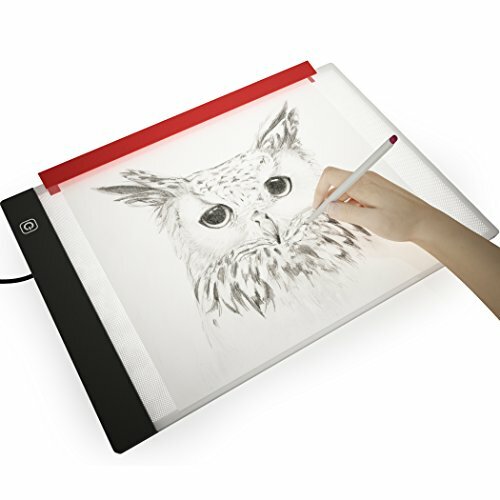 Tiktack offers this super thin light box in just 5 mm, making it super portable. It contains flicker-free technology to protect your eyes from strain and fatigue. The included USB cable allows you to hook it up to your laptop, the car, a battery pack, or plug it into the wall. The stepless adjustable light system allows you to control the brightness up or down with just a light touch of the button. A ruler on the top and left side of the light box is a handy feature for artists who need precision. This light box has dimmable touch technology so you can adjust the light to whatever level you need. It is ideal for designers and artists and features a print scale on the workspace so you can easily get your measurements perfect. Diagonally, it gives you 26.8 inches of workspace. This model weighs around 6 pounds and is highly reviewed by professionals who use it for work. It is easy to clean and has a nice acrylic surface. 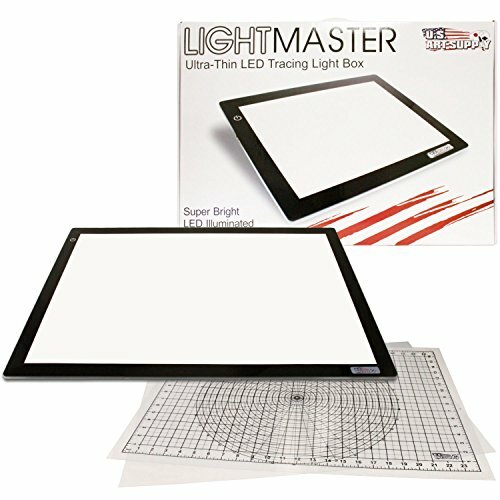 This lightbox from US ART SUPPLY is perfect for all types of art projects. Its larger workspace is a favorite among customers who have bigger projects and need the extra space. It has a bright even light that adjusts gradually up or down. The hard, ink repellent surface stays cool while you work and it is thin enough that it won’t change the height of your surface enough to be uncomfortable when drawing. The flicker-free lamps protect your eyes from strain and last up to 50,000 hours. One customer complaint that the unit failed after a year and a half. This lightbox by artograph is reminiscent in shape of the retro boxes of the nineties, but with an entirely upgraded design. The work surface is 10 inches by 12 inches, and it has a built-in storage tray to hold your pencils or marker. Great for crafters and artists who need an all-around sturdy light box for their projects. Light is emitted from a row at the top making the light on the surface uneven. 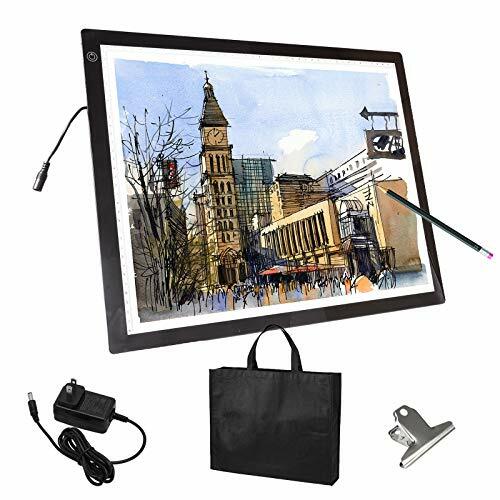 This lightbox by Voilamart features a large 23.8 by 17-inch workspace and will fit into a backpack or the carrying case that comes with the unit. It has three brightness levels that can reach 3100cd/m2. The Voilamart is ideal for anyone who needs super bright light for their project. It is portable and comes with a power adapter so it can easily be plugged into any wall outlet. It features a filter that helps to protect from eye strain. 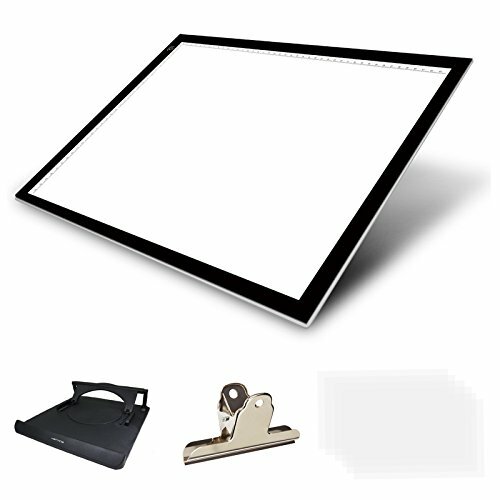 This extra large lightbox from US Art Supply features a 17×24 work surface for bigger projects and a dimmable touch button that allows you to adjust the light to your preference. It has an 11 watt LED panel that is flicker free and super bright. The maintenance-free bulbs last up to 50,000 hours. It is lightweight and portable and at ⅜ of an inch thick can easily fit into a backpack or laptop bag so you can use it on the move. This design is perfect for animators, architects, and designers. 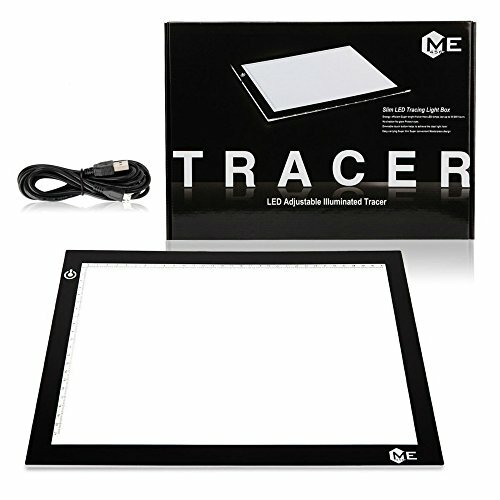 The Huion Thin Light Pad is an ideal choice for professionals and can be used in tattoo tracing, art projects, architecture, design, slide viewing, and even for looking at x-rays. It is only 7.33 millimeters thick and features adjustable brightness using a touch button that will remember your last brightness level for you. The LED lights ensure that this light board stays cool to the touch. 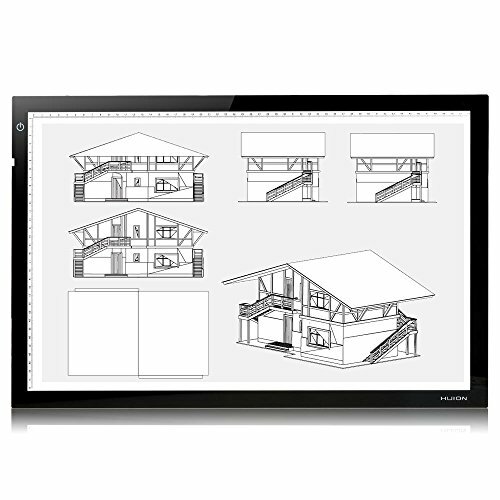 This light box has a jumbo 12.6-by-20.5 inch work surface and is the largest lightbox offered by Huion. So large, it is effectively a light table. It is ideal for working on projects where you need a lot of space. This large Huion light table has a 6 ½ foot power cord and AC adapter and is super bright. It features energy efficient LED lamps that can last for up to 50,000 hours and can easily be adjusted at the touch of a button. It will memorize your last setting so the next time you turn it on to use you won’t need to adjust it unless you want to. Customers say it is easy to accidentally turn it off due to the location of the power button and its sensitivity.